Over the past year, Cardiogram has made waves showing off the potential of wearable technology in ways that make a meaningful difference. Its study with the University of California, San Francisco has shown that its technology can detect atrial fibrillation with 97% accuracy, and that it has the potential to detect both hypertension and sleep apnea. What's impressive about this is that it's all drawn from the heart rate sensor. Yes, the tiny little green-light sensor that's in many wearable devices, from the Apple Watch to Fitbit Alta HR. It has the potential for a lot more than it's currently doing. The key to Cardiogram's success is DeepHeart, its neural network that can be used to quickly - and accurately - sift through data to find patterns and surface potential problems. DeepHeart uses two simple metrics to do big things like detect atrial fibrillation and sleep apnea - heart rate data and step count. That begs the question, how in the world does DeepHeart detect things like atrial fibrillation and sleep apnea using heart rate and step counts? It's all down to how DeepHeart can interpret that data. Brandon Ballinger, co-founder of Cardiogram, tells Wareable that it not only uses those metrics, but the context in which those metrics are related to each other. "If you walk up to go to the bathroom your heart rate is going to go up, and when you stop moving your heart rate is going to go down," Ballinger says. "The slope at which it goes down, the heart rate recovery, is actually a predictor of hypertension and cardiovascular disease, overall survival." So DeepHeart can see and take advantage of the relation between heart rate and step count, and then see how often your wearable device is taking a reading (for instance, on the Apple Watch it's every five seconds). In the study, Cardiogram and UCSF are taking those metrics and extending them to multiple tasks. So rather than checking your stress level or how well you're recovering, as the Cardiogram app regularly does, it looks for indicators of potential illnesses. So if a small company like Cardiogram can take simple metrics and figure out how to detect things like atrial fibrillation and hypertension, why can't big companies like Apple or Fitbit do the same as quickly? Because Cardiogram got a head start. Cardiogram has over 30,000 users, and its study with UCSF has over 6,000 participants. All of those people are feeding Cardiogram data to help improve DeepHeart's capabilities, but the trick to getting that much data isn't signing up more people, it's keeping them around, something other studies struggle with, according to Ballinger. "One of the challenges that the first five ResearchKit apps had is that they lost 90% of their users in the first 90 days," Ballinger says. "And if those users don't have the app installed or they're not engaging with it then you're not getting data." Ballinger says that Cardiogram has 54% of its users opening the app 90 days after first installing it. That kind of engagement gives Cardiogram a data set large enough to detect multiple health conditions. But maintaining a high engagement rate is the big challenge. Cardiogram is designed to make it easy for people to check in on their health in a meaningful way they can understand, Ballinger explains. Cardiogram's features seem to be designed to encourage people to open the app three times during the day, which Ballinger says is about the average for a user. People often check it in the morning to see how their sleep went, then they check it after they work out to see their recovery, and then they'll check on it another time to see how stressed out they got during random moments during their day. "The great thing about heart rate data is that it changes from minute-to-minute and it reflects everything that happens in your life," Ballinger says. "So we have people who use Cardiogram when they watch a scary movie to see what the scariest scene is. We've done things on what Game of Thrones does to your heart rate. We had a user who's dad's cancer went into remission and their heart soared and they [were able to look at] the data." 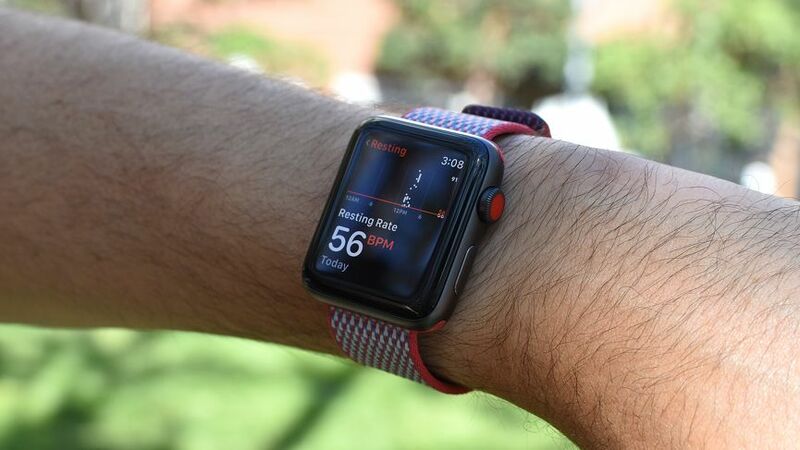 This speaks to Cardiogram's larger philosophy on wearables, as it believes the best way to get people to strap things to their wrist is to give them incredibly valuable health data with continuous sensors. In fact, Ballinger says the big names in wearables, from Fitbit and Apple to Garmin and Samsung, aren't each other's biggest competitors; their biggest competitor is a person who isn't wearing a wearable. "Even though more people are purchasing watches, most people still don't have one," he says. "So there's a lot of work to be done to show everyone that these things are valuable and that everyone should have a continuous health monitor"
Cardiogram plans to show that value to everyone by transforming its platform into the front door to the healthcare system, giving everyone a doctor on their wrist. Apple. Fitbit. Samsung. Garmin. Xiaomi. Huawei. Polar. Fossil. These are the varied names in the world of wearables, each one doing their own thing and building out their own ecosystems. That fragmentation, and potential ecosystem lock-in, is something Cardiogram thinks about. "If you think about it from the perspective of a doctor or a health insurer you might not want to separately set up interfaces with each Apple, Fitbit, Polar, garmin, etc. You might want one that's compatible with all of those, gives you one workflow and let the end user choose which device to bring out." In addition to making it much easier for doctors or health insurers to sign onto its platform, being on as many devices as possible allows Cardiogram to gather an even wider data set. It can run that data through DeepHeart and then present that back to doctors and show them things they would have missed. "We're picking up patterns that would actually not be obvious to a cardiologist or any sort of doctor if they were just looking at the raw data," Ballinger says. "But we're able to do that because it's the largest data set." In the short term, that may mean atrial fibrillation, sleep apnea and hypertension, but in the long-term Ballinger says Cardiogram is excited about how much health-based information you can gleam from the "humble heart rate sensor." As the heart is connected to many organs via nervous systems, it has a vantage point into what's going on in your body. This includes things like being able to detect signs of diabetes from your heart rate. "There's some evidence that as people develop the earliest stages of insulin resistance, their pattern of beat-to-beat heart rate variability shifts and they get less beat-to-beat variation, higher resting heart rate, lower heart rate recovery," Ballinger explains. People will always need blood tests to confirm these types of conditions, but Ballinger says a non-invasive and affordable way to let people know something is wrong is a potential boon to the healthcare system. Eventually, Ballinger hopes Cardiogram can be a healthcare provider that guides people through the healthcare system, as he thinks many people get lost in its labyrinth. Cardiogram would be able to walk you through screening, point you to a place to get testing to confirm and then somewhere where you can undergo potential treatment for your affliction. However, to get there Cardiogram wants to be able to present clinically tested data to show doctors and health insurers that its technology works - hence the study with UCSF. Unlike the tech industry and press, Ballinger says doctors tend to be inoculated from hype until they see data backing up claims. So Ballinger warns against calling major advancements like sleep apnea detecting revolutionary until there's enough data to convince doctors to get on board. If Cardiogram's dream ever does come true, and it's able to get its app and software on every platform possible - including Fitbit, where it's not yet available - then it could open up the potential for an even more affordable way for people to gain entry into the healthcare system. "A doctor's visit, even if you don't pay for the whole thing, costs several hundred dollars. A sleep study costs several thousand dollars. Because we have people purchasing these wearables with sensors already, and because software can be done with zero marginal costs, I think there's a chance it could reduce the cost of the healthcare system and make it cheaper for everyone"